"With consumate gallantry and intrepidity, Major Carswell gave his life in a supreme effort to save all members of his crew. His sacrifice, far beyond that required of him, was in keeping with the traditional bravery of America's war heroes." Horace S. "Stump" Carswell Jr., was born in Fort Worth, Texas on July 18, 1916. Carswell attended North Side High School where he was a standout athlete and in 1933 he scored the winning touchdown in an Armistice Day game against Wichita Falls. After graduation he attended Texas A&M but transferred to Texas Christian University following his freshman year. Carswell played varsity baseball, football and basketball at Texas Christian. In baseball he was a utility man - playing the infield and outfield. Carswell graduated in 1939 with a BS in physical education and joined the Army Air Corps as a flying cadet in March 1940. While stationed at Goodfellow Field in San Angelo, Texas, Carswell married his college sweetheart, Virginia Ede. Second Lieutenant Carswell completed flight training in November 1940 and then attended Combat Crew School at Hendricks Field, Florida. He later served as an instructor and flight commander at Davis Monthan Field in Arizona and Biggs Field, Texas. He was promoted to captain in December 1942. By April 1943, Carswell was a major. A year later he was on his way to China to join the 308th Bomb Group of the 14th Air Force. Based at Kunming, the 308th Bomb Group flew Consolidated B-24 Liberator heavy bombers to support Chinese ground forces and attack Japanese shipping in the South China Sea. Major Carswell was named operations officer of the 308th's 374th Bomb Squadron. On October 15, 1944, Major Carswell made a solo attack on a formation of six Japanese naval vessels in the South China Sea. Despite concentrated anti-aircraft fire, his crew scored two direct hits on a cruiser and made three further runs on a destroyer, scoring one direct hit that put the ship out of action. He was later awarded the Distinguished Service Cross for this action. On October 26, 1944, Carswell flew a night mission against another Japanese convoy. This time twelve cargo ships and two destroyers. At an altitude of 600 feet, he made his first run against a destroyer and caused damage with a near miss. On a second low-level attack two hits were scored on a large tanker but intense antiaircraft fire knocked out two of the four engines on the B-24. Damage was also caused to the hydraulic system and a third engine. Furthermore, Carswell's co-pilot was wounded. Fighting with the controls of the stricken bomber, Major Carswell tried desperately to gain altitude as he made for the China coast. Once over land, Carswell ordered the crew to bail out, but the bombadier found that his parachute had been severely damaged by the antiaircraft fire and a decision was made to try and get to a safe place to land. But first the bomber had to gain enough altitude to climb over the approaching mountains - on one engine. Before enough height was gained the third engine stopped working. Carswell immediately ordered the crew to bail out and as they did so he prepared to attempt a crash landing with the wounded co-pilot and navigator. Minutes later the bomber hit the mountainside and exploded. Horace Carswell was buried at a Catholic Mission in Tungchen, China. He was survived by his wife, Virginia, and their son, Robert. His body was later moved to Carswell Memorial Park in Oakwood Cemetery, Fort Worth - named in his honor. 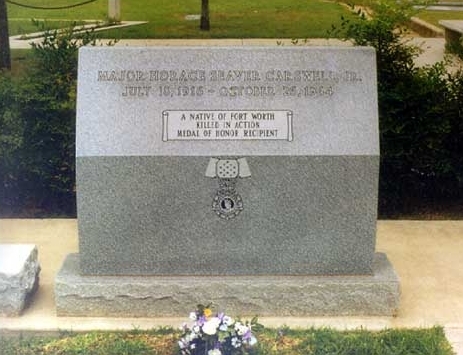 For his heroic self-sacrifice Major Carswell was posthumously awarded the Medal of Honor on February 4, 1946, with ceremonies at Goodfellow Field, San Angelo. "With consumate gallantry and intrepidity," his citation read, "Major Carswell gave his life in a supreme effort to save all members of his crew. His sacrifice, far beyond that required of him, was in keeping with the traditional bravery of America's war heroes." 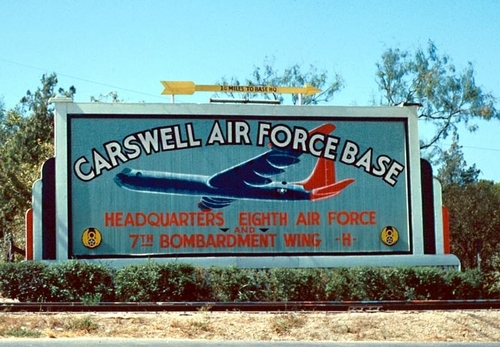 On February 27, 1948, Fort Worth Army Airfield was renamed Carswell Air Force Base in his honor. There is also a Carswell Avenue at Elmendorf Air Force Base in Alaska. At Texas A&M, where Carswell attended his freshman year, there is a life-size bronze bas-relief at the Corps of Cadets Center. Thanks to Roger L Rainwater, Special Collections Librarian, Mary Couts Burnett Library at Texas Christian University for help with this biography.